There are a whole host of home 3D-printer kits are now available and many, like the Printrbot, replace the use of 3D-printed parts with machined, laser-cut, or stamped-out parts. Whether you want a kit with a lot of ready-made 3D-printer parts or a kit with few of them comes down to budget and to personal preference. The kits all share the same RepRap electronics, firmware, and software slicing programs; all can achieve similar high-quality print results with a little care and tuning. There are endless variants of Cartesian-based 3D printers. The 3D printers in the list that follows can all provide excellent printed objects; all are available in kit form or individual components can be self-sourced using guides and construction manuals for advice. MendelMax V2: This machine has evolved through a number of versions, originally using many 3D printed parts to now having many parts laser-cut or machined. 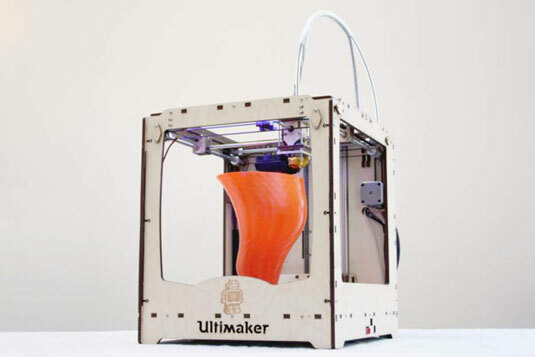 Ultimaker: This 3D printer, again based on RepRap technology, was one of the first kit machines to be sold. It uses laser-cut wooden panels to make a box frame and has a configuration similar to the early RepRap Darwin: The print bed moves only up and down and a lightweight print head moves in the X and Y axes. But the Ultimaker is no Darwin; it’s a very fast printer that introduces the use of a Bowden fed extruder. This method of plastic extrusion moves the mass of the motor and filament-drive system to a static position on the machine; the filament being extruded then enters a slippery PTFE (Teflon)-based tube that does not allow the filament to bend, buckle, or compress. At the other end of this tube (usually about 500mm long) is the moving print head and hot-end that melts the incoming filament being pushed by the remote extruder. This setup allows the (now very light) print head to move very fast indeed, so faster printing and potentially higher accuracy can be achieved. 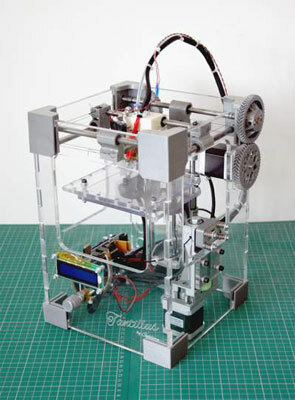 The Tantillus: This 3D printer was originally designed as a fully printable machine. Tantillus is a lot like a miniature Ultimaker. Original versions not using the laser-cut frame have the highest percentage of printed components used in any RepRap printer. The case frame construction was originally fully 3D-printed. This design had one of the highest proportions of 3D-printed components of any RepRap. Another version, using a laser-cut acrylic case, was designed for an easier DIY kit and successful crowdfunding campaign by its creator Sublime. One of its unique features is the use of high-strength fishing line instead of belts to provide the X and Y motion, resulting in a fast-moving machine and high-quality prints. Almost all home 3D printers have about the same level of quality and speed, so don’t get too hung up on the exact model to choose for your first machine. This is especially true with a RepRap; you will be able to upgrade and evolve the design or print out most parts for another or future model!